Tumbled stones measure 0.5" - 1.15". 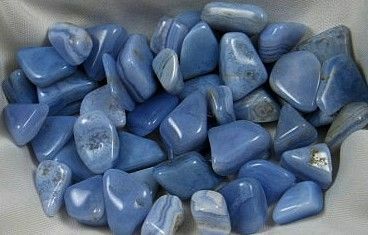 Blue lace agate has a highly inspirational influence when used for inner attunement. As it contains the qualities of air, movement, flight, and grace it can help you to reach high spiritual planes. It is a stone for the throat, heart third eye, and crown chakra. By activating these chakras, it helps you to enter high-frequency states of awareness. Blue lace agate is helpful in relieving back pain. It can also be used to facilitate the mending of breaks and fractures. Commonly mined in Namibia.